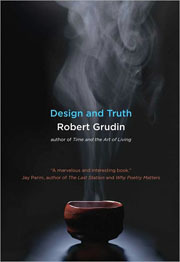 Design and Truth is a compelling book, until it isn’t. With that said, it still deserves a place on the library shelf of anyone who is interested in design and, more specifically, concerned with its philosophical and moral underpinnings. As Robert Grudin ably points out, design—product, architectural, urban, landscape, scientific, economic, political and religious systems, and cultural norms—underlies and permeates all that we do. “Design is the purest exercise of human skill. . . . Each new design is a new discovery, conveying a specific truth about our relationship to nature and to each other,” he writes. A slim volume bolstered by very few images, Design and Truth begins splendidly with the recounting of Sen no Rikyu’s redesign of the Japanese tea ceremony. The 16th-century tea master repurposed the ceremony, historically defined by ornament and power and exploited by the rich and noble, to one infused by simplicity and integrity that stressed the equality of all who participate in it. Unfortunately, Sen No Rikyu’s increasing popularity and influence led the warlord Toyotomi Hideyoshi, with whom the tea master had missed an appointment because he was drinking tea, to order him to commit suicide—which Sen No Rikyu did, in 1591 at age 68. Grudin’s insistence about the power of design, even in unexpected scenarios centuries ago, is well taken. Seemingly, nothing entangled in the grand cabal of design is left unexplored. Among the dozens addressed are the above mentioned as well as Churchill, Minoru Yamasaki, Heidegger, Marcos Aurelius, Francis Bacon, Simone Weil, Vitruvius, Machiavelli, Shakespeare, Sofonisba Anguissola, Castiglione, Socrates, Boccaccio, the Bauhaus, Cicero, and Toqueville. Lou Dobbs and Hitler even make appearances. President Obama, George Bush, and Teddy Roosevelt each have a place. And that is just for starters. Even baseball is fleshed out as a social design in time, albeit existential. In 1525 Frederico Gonzaga, ruler of Mantua, invited the artist Giulio Romano to build and decorate his palace. Grudin compares this to the design process of the World Trade Center; the point is that Gonzaga gave Romano free reign to design what was appropriate for the site, whereas Minoru Yamasaki’s initial, more modest design for lower Manhattan was overruled by the Port Authority’s much larger complex, and one ultimately far less safe. The rest is history. Tellingly, this is where the reader is provoked by Grudin’s approach and knowledge of design. In such ways does Grudin provoke readers to think about how design indeed governs our lives.